The Ethiopian Airlines pilot had no idea that the lady bounding off the bus filling with passengers headed out to board ET Flight 602, was an aviation blogger with plenty of ink both behind and in front of her on the subject of the prone-to-ignite Dreamliner batteries. But, as are many Ethiopians, he was courteous and answered my questions in the 45 seconds I had before being shooed back on the bus by the driver and my fellow passengers. Pointing across the runway at the plane I thought to be ET-AOP, I had asked him, "Isn't that the airplane that caught fire back at Heathrow last summer?" Will you feel okay flying it? "I've already flown it about 10 times Madam, it's fine." I could only get out a "Good to hear," before being ordered to re-board the bus. I didn't have time to clarify whether he was feeling good about the repairs or the larger issue of whether lithium ion batteries are reliable enough to be used in aviation. On that the jury is still out. The AAIB bulletin takes the same approach as the NTSB when it issued recommendations last month as a result of the JAL Dreamliner event in Boston. 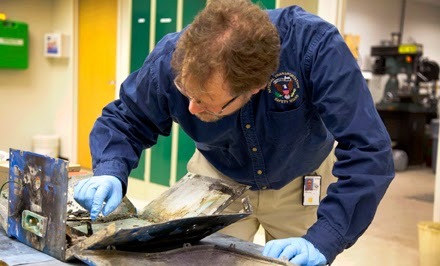 "Although these two investigations are not linked and the respective batteries differ, both in their chemistry and aircraft application, the NTSB and AAIB investigations made similar findings with respect to the certification/approval process and testing requirements for lithium batteries," the AAIB noted. It was not lost on me that even as the British air safety authorities were hitting the send button on this bulletin, raising once again the disturbing question about how much regulators don't know about the relative safety of energy products on airplanes, the Ethiopian pilot was headed out to fly out of the two Dreamliners parked side by side. From the Boeing 777 on which I was a passenger, I watched ET-AOP, ET-AOT and ET-AOU taxi and depart. Two other Dreamliners were at the gate. In fact, Bole International Airport is practically littered with 787s because the Dreamliner is finally living up to its name and becoming a dream-come-true for Ethiopian Airlines. The seven 787s in the fleet have a dispatch reliability rate of 98.7 or point 8 percent according to airline CEO Tewolde Gebremariam. "Maintenance reliability is also a function of utilization so right now we are in a good position because our utilization is higher than the industry average, Gebremariam told me - around 14 hours a day. During a ninety minute interview on a variety of subjects, the airline chief said he is feeling good about this airplane though he is not ruling out the possibility that Boeing engineers are hard at work re designing the Dreamliner to use a less volatile energy source, as I speculated in this blog post several months ago. "We did not have first-hand experience on a problem with the battery" he told me - referring not to the little ELT battery that seems to have been the source of the blaze on Queen of Sheba, but to the two lithium ion batteries used to provide engine start up and supplemental power on the B787. Gebremariam said it is possible that the Japanese airlines may have had batteries with quality control issues. "Without first-hand experience it will be very difficult for me to say, 'yes it must be changed,'" he said of those batteries. "Boeing will have to make that decision in consultation with the FAA of course." I remain cynical - maybe concerned is a better word - about the future of lithium ion batteries on airplanes. Still, after a day with two insiders who are cheerleaders for the Dreamliner, I can't help but cheer that Ethiopian is finally getting to realize all the promised improvements in range and efficiency that made it and so many other airlines buy this airplane in the first place. The Chinese are working on lithium batteries for their diesel submarines. Going to be real interesting to see how it works. The innovations of the B787 that held so much promise originally will I think, slowly be reversed to more conventional technology. Reading between the lines of Boeing's plans and strategies, especially on the B777X, metallic fuselages, bleed engines, hydraulic powered flight surface mechanisms and brakes will remain on the new 2020 777 jet. From a report that I read, a A330-300 built today is still lighter than the B787-9, due to 330's older generation(and lighter) engines.